My previous post is something I wouldn't want to blog on a regular basis. I really pray that I would never again write an almost near-to-death experience. At some point, I know that I needed to be awakened. Despite of everything, I'm keeping my faith and trust with the Lord. To my blog friends and readers who sent heart warming messages, thank you very much. On the lighter side, allow me to share pictures from the event I recently attended. Remember my post about pain and vanity? I mentioned that I need to attend a rare event that requires me to dress up. I was actually referring to the recent wedding of a colleague and friend. I showed some pictures of her wedding in this Beautiful Sunday series post. The two pictures were not enough to showcase all the happiness on that day. Allow me to share more pictures from her day. 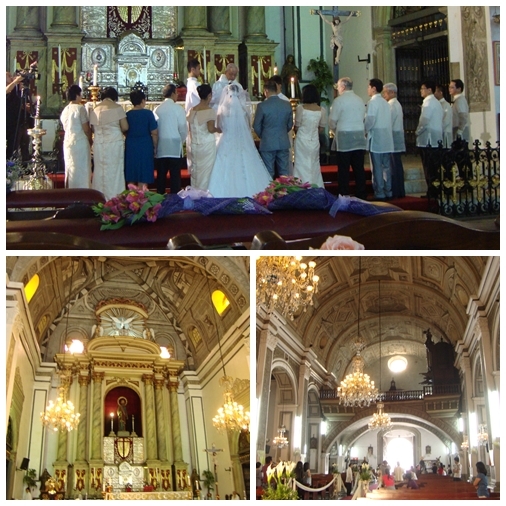 The wedding ceremonies was held at the historic San Agustin Church in Intramuros, Manila. The church has been existing for hundreds of years. It has survived a number of wars and natural calamities. The architecture and the paintings on the ceilings perfectly define the words, work of art. 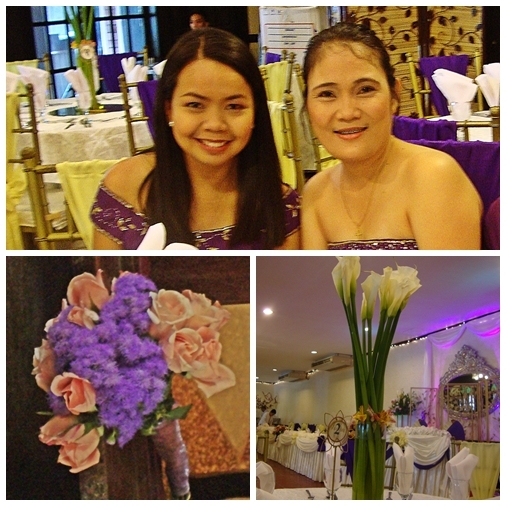 My friend chose violet as her color motiff so that explains our dress, venue, flowers and all the details. I made the photo look more ridiculous. I hid some faces because I'm not personally close with the other girls and I haven't asked their permission for this post. At the end of the day though, all I can see are faces of love, beauty and happiness. Hope you enjoyed my short and quick post. I love weddings. So much detail and beauty. The wedding dress - LOVE! SO pretty with the beaded high neck and sleeveless. The violet color is so pretty too...GORgeous color on you!! 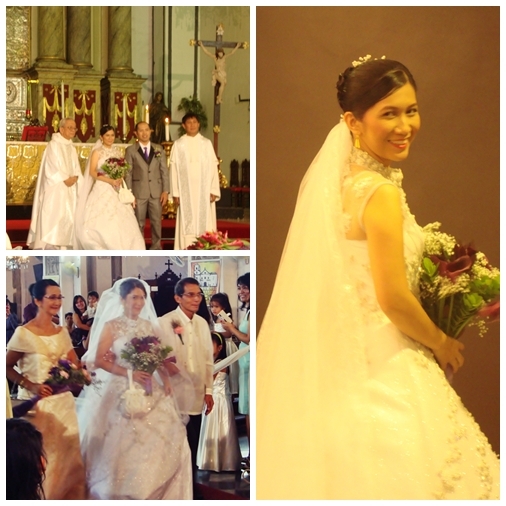 :)You look beautiful (the bride too of course!)!! That picture of the bride looking over her shoulder is gorgeous! I love your violet dresses with the yellow sash - very cheery. You look great in yours! You may not like the color violet, but it looks lovely on you, Diane. You look absolutely adorable! 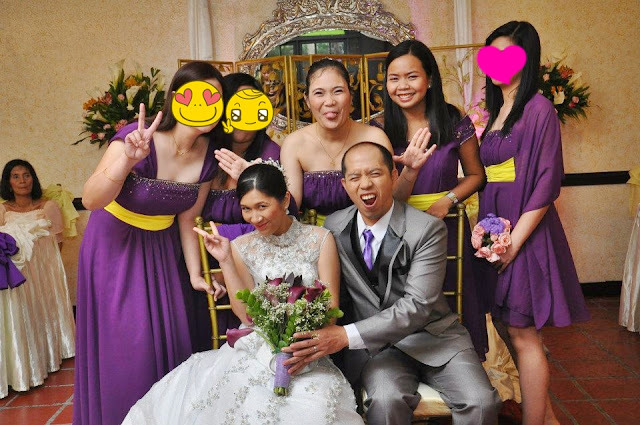 I love seeing people having fun at a wedding and not making it too uptight.